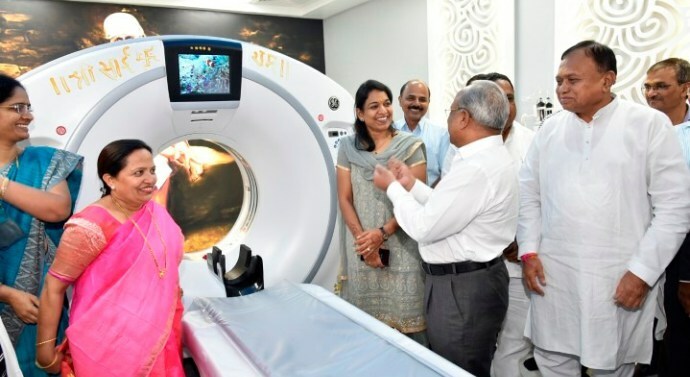 Chairman of Shri Sai Baba Sansthan Trust, Shirdi Dr.Suresh Haware inaugurated an advanced 128 Slice Computed Tomography (CT Scan) machine worth Rs.6.53 crores at a function held on Monday, 5th November 2018 in Shri Sai Baba Hospital. Vice chairman of Sansthan Chandrashekhar Kadam, Chief Executive Officer Rubal Agrawal, trustee Bhausaheb Wakchaure, trustee and President of Shirdi Municipal Corporation Yogitatai Shelke, Nalini Haware, Deputy Collectors Dhananjay Nikam, Manoj Ghode Patil, Chief Accountant Babasaheb Ghorpade, Medical director Dr. Vijay Narode, Medical superintendent Maithili Pitambare, Dr. Preetam Vadgave, Administrative Officers Suryabhan Game, Dilip Ugale, Radiologist Dr. Vyavhare, and other dignitaries were also present on the occasion. Wipro GE Company’s advanced 128 Slice CT scan machine worth Rs.6,53,29,397 has now been installed by replacing the old 64 Slice C.T. scan machine. This is the only machine in Ahmednagar district with all advanced features and is faster than older one. However, the diagnosis by this machine will be done as per the old prevailing rates only. This will be more helpful in the treatment of heart coronary angiography. Chief Executive Officer Rubal Agrawal informed on the occasion that Sansthan has placed orders for purchase of 127 advanced medical machineries and equipments worth Rs.35 crores this year. Out of which 90 machines have already been installed. The installed machines include Cath Lab, CT Scan, Colour Doppler, Dialysis, X-Ray, OT Table, Multipara monitor. The new MRI machine will be operational from 15th December 2018. The remaining machines for which orders were placed will be functioning within the next two months. garwal also added that in the last 15 years, for the first time such advanced machines are being installed in the Sansthan’s hospitals.